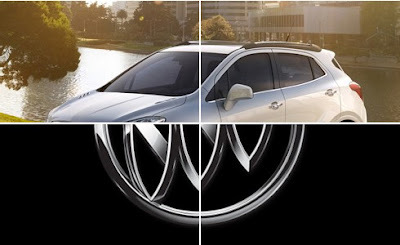 Buick teased yet another picture of its very Subaru like Encore; this week’s picture came with no new info, and none has leaked since the tidbits of information on the Mokka surfaced late last week. What we can see of the Encore’s rearward styling in this new photo is very Subaru like, but also shares some cues with Pontiac’s Last wagon, the Vibe, right down to the Opel version’s light use of cladding, to me this looks more like a baby VUE than a Baby Enclave. I maintain my statements that I think this would be better in Saturn’s lineup, but this may be a great seller for Buick, that is if they don’t slap some astronomical price tag on it. Thankfully these new photos show that the images that were leaked about 2 weeks ago are Chops, as the rear DLO doesn’t have the foreword sweeping Lancia like edge that the chops had. The Encore appears to have the scalloped bone line like the Regal and Verano, which would give it a more signature Buick look, despite the rest of the sheet metal being decidedly Saturnesque. The Profile DLO has a slight unconventional kick up like the one found on the 2013 Chevrolet Malibu, the taillights don’t appear to be LED based, but I could be wrong. Personally I’d like the roof rack to have a little less plastic, or they could just take it off, it might give the car a more premium appearance. This might throw a little heat Acura, Infinity, & maybe even Lexus’s way, but I think to become a Buick it should have more resolved sheet metal. It should help retain some Pontiac and Saturn customers, so this could be a very good thing for Buick, because the VUE and the Vibe sold pretty well, but it might make it harder to justify shelling out $36,600 for an entry level Enclave, or $37,785 for a fully loaded Regal GS.